Schell’s The Art of Game Design is not designed to be a User Experience design text. But it is designed to be a user experience design text. It’s about designing experiences within the game realm, but unlike many other foundational texts in contemporary user experience design which ground themselves in the web and product, Schell grounds us in the broadest terms from the book’s first pages. What Skills does a Game Designer Need? 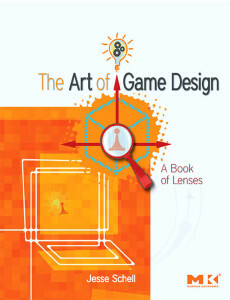 By calling them to mind in the first 10 pages, Schell reminds the reader that Game design, as in all experience design, requires a sound understanding of a vast range of disciplines. Animation, Anthropology, Architecture, Brainstorming, Business, Cinematography, Communication, Creative Writing, Economics, Engineering, Games, History, Management, Mathematics, Music, Psychology, Public Speaking, Sound Design, Technical Writing and Visual Arts (p 3-4). By calling them to mind in the first 10 pages, Schell reminds the reader that Game design, as in all experience design, requires a sound understanding of a vast range of disciplines. Like a Victorian era naturalist, who must combine knowledge of several scientific disciplines; or a true polymath, the Designer [notice dropping the prefix] must have a diverse breadth of expertise, but also know enough to know what they don’t know. the Designer must have a diverse breadth of expertise, but also know enough to know what they don’t know.